Last Friday (Feb 2nd), we rolled out a new Domain Rating calculation (which was announced earlier that week). And subsequently, we issued a small “patch” to further refine it. But these kinds of changes never go entirely smoothly, so there were quite a few people who disliked this update. I’ll gladly address all of these things and help you persuade your clients that there’s absolutely nothing to worry about (as long as their traffic and rankings are going up). Like I just mentioned, a lot of people were connecting their DR score to the keywords that their website ranks for, the search traffic it gets and some kind of “authority” that it has. Well, please be advised that Ahrefs’ Domain Rating is NOT a measure of “website authority” and it is not calculated off your search traffic or rankings. Domain Rating is a metric that shows the “link popularity” of your website compared to all other websites in the world on a scale from 0 to 100. And I used quotation marks around the term “link popularity” because it refers to a rather specific way that we calculate it here at Ahrefs. As you can tell, there’s nothing about traffic, rankings or even “link spam.” The calculation is quite straightforward and easy to understand. So please don’t draw lines between the DR of a website and anything else but the websites that are linking to it. Q: But why then don’t you calculate DR based on URL Ranks of all referring pages to a given domain? A: Well, at the present moment, to calculate DR we look at how domains are interlinked. And there are 174.6 Million domains in Ahrefs’ database, which are being used in this calculation. As for pages, we have 189.5 BILLION of them in our database, so you can probably tell how using them in DR calculation would ramp up it’s complexity (and cost). A: “That is truly a good idea and it should be much easier and cheaper to calculate than the previous one. We did try it before, but stumbled upon a few roadblocks that didn’t have any simple solution. So we had to put that idea on hold. What is DR good for? How to use DR for SEO? Even though search traffic is not taken into account when calculating Domain Rating, the two correlate very well. Which is of course expected, because websites with tons of search traffic tend to get a lot of backlinks. And vice versa. But, at the same time, it is perfectly normal for DR10 website to have more search traffic than DR20 website. That happens because DR is not the only contributing factor to your search traffic. So, as I said earlier, Ahrefs’ DR is purely a measure of a websites’ “link popularity” (as measured by Ahrefs), but it can be very useful when you look at it alongside some other sitewide factors. Our own website (ahrefs.com) is ranked at position #3,923 according to Ahrefs Rank. This means that we’re in the top 4000 websites in the entire World by our “link popularity” (as calculated by Ahrefs). When we plot Ahrefs Rank on a scale from 0 to 100, we get a two‐digit Domain Rating of 85 for ahrefs.com. Both AR of #3,923 and DR85 paint a nice picture of how ahrefs.com compares to the rest of the websites in the world by its “link popularity”. But, at the same time, these numbers are not immediately actionable. Our main competitor (popularity‐wise) is moz.com, which has an Ahrefs Rank of #576 and Domain Rating (DR) of 91. Now our own numbers don’t seem that impressive, right? Comparing your DR/AR to other websites in your niche can give you a lot of additional insight about the “link popularity” of your own website. When we compare ahrefs.com to moz.com, we realize that there’s still a ton of untapped link opportunities for us. In other words, DR is a good metric to discover competitors who’re doing better than you. Then, you can piggyback from their backlink profile (which is easy to do via the Link Intersect tool). And if you’re in a position of the leader, you can keep an eye on that DR gap and monitor if your competitors are catching up with you. 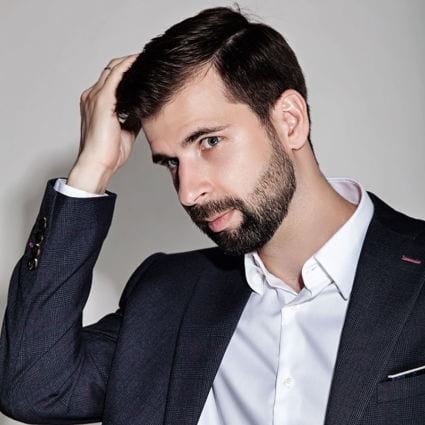 When doing link building, you need a way to vet your link targets and estimate the “value” that you’re going to get in exchange for your efforts. DR naturally seems like a good metric, since it is meant to show the relative “link popularity” of a given website. This should then translate into the amount of “value” that you will get if they link to you. But there are quite a few caveats in using DR (as well as any other sitewide “authority” metric) for link prospecting. So we’ll discuss it in a separate section of this article. Why did we change DR scores? Because YOU asked us to. A website with DR over 30 was perceived as being “strong”. A difference between DR40 and DR45 was perceived as quite dramatic. A website’s DR of 50+ was supposed to positively affect it’s rankings/traffic. A link from DR50+ website was considered a “strong” link. But none of these things were true (with the old DR scale). There was lack of information about how we calculate DR and what we advise it should be used for. As you can tell, we’re doing our best to fix both of these things. How often did you see a domain with DR of less than 10? I bet you didn’t see any at all. 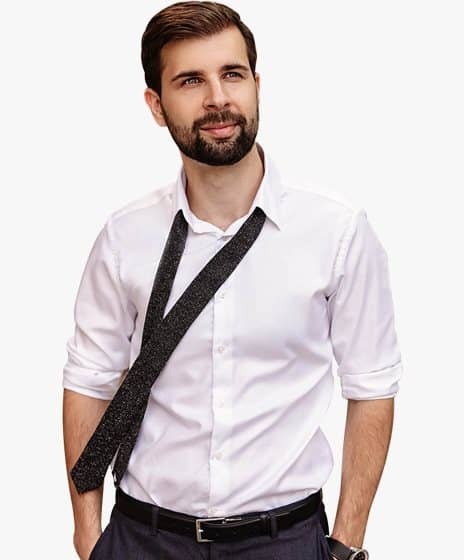 A brand new website with a handful of backlinks immediately gained DR30+, making its owner quite happy and satisfied (especially if he/she was a link seller). But we wanted to have an objective DR scale; one that would accurately represent the “link popularity” of all websites on the World Wide Web. So with the release of the new DR calculation, the majority of websites (that were previously clustered at DR20‐50 range) were moved to DR0‐30 range. This is where they objectively belong compared to the likes of Twitter, Facebook, Google, etc. As you can tell, ~83.9 percent of all domains are now clustered in DR0‐5 range. Because this is where they belong, according to their backlink profile. IMPORTANT: please keep in mind that DR is not calculated from the raw number of dofollow referring domains alone (see details above). So these numbers of d.ref.domains per cluster are just raw approximations. They only serve as a point of reference and not the actual number that is required to reach certain DR score. IMPORTANT #2: please read what is written in the box above and please don’t ask us why your DR doesn’t match your dofollow ref.domains (or vice‐versa). That’s because the DR calculation is a bit more complicated than just raw number of dofollow ref.domains. You may have noticed that the average number of d.ref.domains for sites in the DR 36–40 range is actually lower than for sites in the DR 31–35 range (546 d.ref.domains vs. 314). We were surprised to see that as well, and after some digging discovered an ugly spam cluster that was skewing the numbers. That gives us some nice food for thought as for further refining our web crawler. How to tell if the new DR is better than the old one? Before the change, the difference between the two was only 15 points. And I really don’t think my small personal blog deserves to be this close to Ahrefs (which is in the top 4000 websites in the world according to Ahrefs Rank). So now the difference is 30 points (on a logarithmic scale!) which seems to be much more fair. Q: We had DR50 and then dropped to DR18, and now we’ve settled at DR43. What does it all mean? A: Like I said, there was an update and then there was a “patch.” Based on the feedback from the community it felt that we have “punished” smaller sites a little too hard. So we went back to the drawing board and figured how we could use 0 to 100 scale a bit more effectively. What about 146 million websites in DR0‐5 range? Like I said earlier, with the new DR scale ~83,9% of domains in Ahrefs’ database are now in DR0‐5 range. That seems like a fair granularity, considering that most of these website hardly have any good backlinks. But some of our customers requested that we give even more granularity and add decimals to this DR range. Unfortunately, this kind of change would require a lot of effort from our team. And we believe that this time and resources would be better spent creating some other Ahrefs’ tools and features. So we had to put this on hold for now. And, besides, you can always reference Ahrefs Rank when analyzing smaller sites, which offers much greater granularity. In my original announcement of the DR update, I mentioned a few spammy websites and what would happen to their DR after the update. This example “tricked” a lot of people into thinking that our DR update was targeted at spammy websites only. And, as long as your website is legit, you won’t see any drop. I already removed that part to avoid misleading more people. But I guess a lot of people didn’t read this far. So that confusion is totally my fault, sorry. 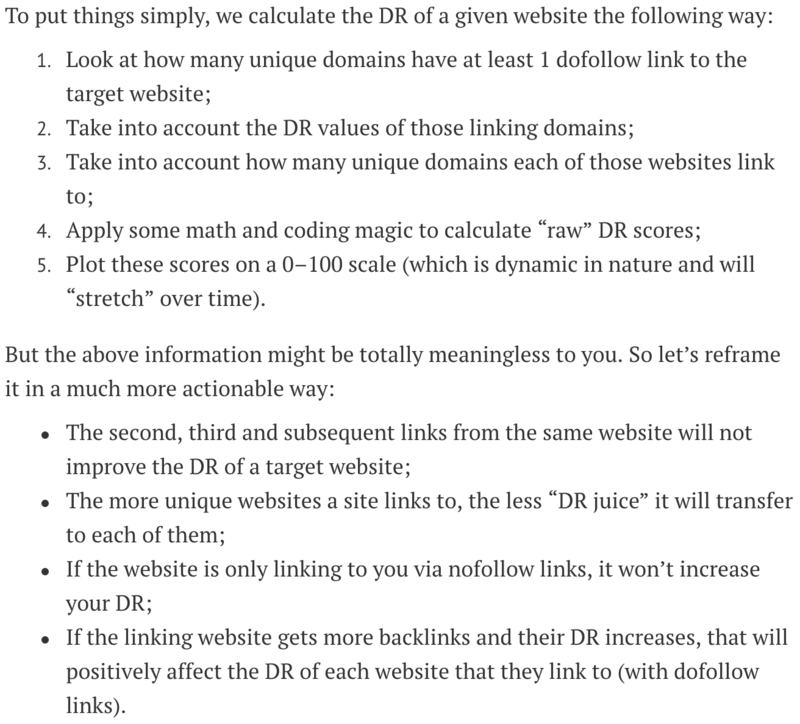 In other words, we didn’t change the way we count links from domain to domain or how we assign “raw” DR values (and build Ahrefs Rank off them). What changed is the way we plot these “raw” DR values onto 0–100 scale. Because the previous DR scale had some glaring issues and wasn’t really objective. And while it is true that with the new DR score, it would be quite hard to pump your DR to 40+ via cheap spammy links, growing your website to DR40+ via white hat links won’t be much easier. In other words, spammers can still “pump” DR with low quality links, but it is much harder now, because of a better DR scale. In order to deal with artificially inflated DRs we’re now experimenting with a brand new metric that would focus purely on the quality of the backlink profile and effectively discount any “questionable” links. However I can’t give you any ETA, as it’s just an experiment at the moment. If you were using Ahrefs’ DR metric as part of your SEO reports to clients, you might have a hard time explaining the change (especially the drop). So let us do this for you (just point your clients towards this part of the article). If you’re seeing a drop in your Domain Rating (DR), it doesn’t mean that your SEO agency has been doing a bad job building links to your website. As I explained in the section above, the DR re‐calculation wasn’t meant to “uncover” any questionable link building tactics. The goal was to put every website in the world in the right place on a 0–100 scale according to its “link popularity” (as calculated by Ahrefs). If you see a big change in your DR, it doesn’t mean that your SEO agency was doing a very bad (or very good job) with link building. It only means that your previous DR wasn’t quite fair. That said, this DR update affected absolutely all ~174M websites in our database (some went up, others down). The “quality” of pages/content that the links are coming from. If all the above look good (and you don’t have to be an SEO expert to analyze them), then your SEO agency is doing a good job. At the end of the day, you’re not paying your SEO agency to grow the Ahrefs’ DR metric of your website. You’re paying them to bring more paying customers to your business via traffic from Google. The problem with using DR (or pretty much any other sitewide metric) for link prospecting is that Google never said anything about the benefits of acquiring a link from a “popular” website. Google’s PageRank algorithm works by passing value from a page to a page, not from domain to domain (or from a domain to a page). Which link do you think would most help your page rank better for your target keyword? If you ask me, I voted for the link from a higher‐UR article, but lower‐DR domain. So does this mean that using DR for link prospecting doesn’t make sense? DR is a near perfect metric to help you vet the “link popularity” of your link prospects (given the size of Ahrefs’ backlink index and the frequency of updates). High “link popularity” basically means that there’s a decent chance that a page on that website will generate some backlinks and have high‐UR. I mean, there’s always a chance that a page on a low‐DR website will generate backlinks and get high‐UR. As shown in my poll above. So, we do recommend that you use DR for linking prospecting. But we don’t recommend you to use it in isolation from other factors. What’s the overall quality of the website and their content? Will this website be around in 5 years? Will it grow or stay the same? Will there be more changes to DR (or any other Ahrefs’ metrics) in future? A lot depends on whether YOU need us to change anything about the current DR (or any other one of Ahrefs’ metrics). Like I said earlier, we changed DR not because we wanted to, but because we had to—it was your feedback and your questions that prompted us to do this. I can’t say if we’re going to make more changes to DR in future or not, but what I can tell you is that we’re experimenting with a few other interesting metrics that could potentially be a perfect complement to DR as it is today. You might have noticed that we didn’t quite “nail” the DR update on our first attempt. After releasing v2.0 we got some feedback from our customers (with examples, arguments and reasoning). This allowed us to create a “patch” and release v2.1. And we’re quite happy that it went how it went. This made a lot of people pay attention to our Domain Rating metric and helped our team make it better than we initially planned. If you’ve been Ahrefs customer for a while, you may know that we’re very receptive to feedback from our users. So if you see any way we could make Ahrefs tools/data even better, you can use this handy little service to submit your feature requests.